Last week, my family and I tried out our brand new All American No. 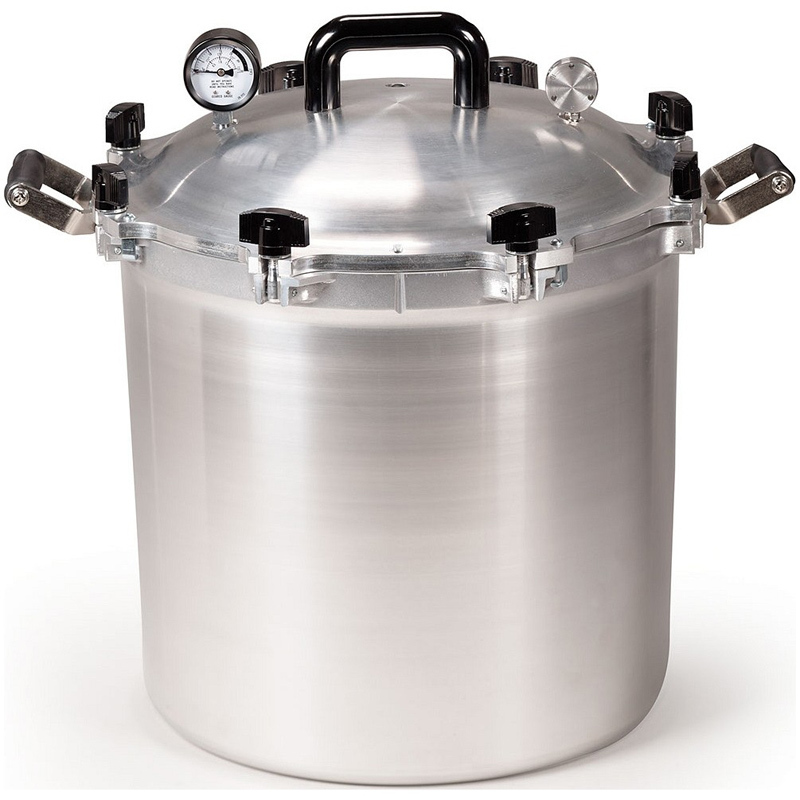 941 pressure canner. It has a 19 quart capacity! We had never pressure canned before and we decided to do it over a wood fire. We had previously tested our skills by water bath canning over the same fire set-up. See 10 Tips for Canning Over a Wood Fire for more general information. We had success with both types of canning, but pressure canning takes just a little more knowledge and attention to be successful. In the end, we were able to put up a good amount of food and learn a lot for next time! 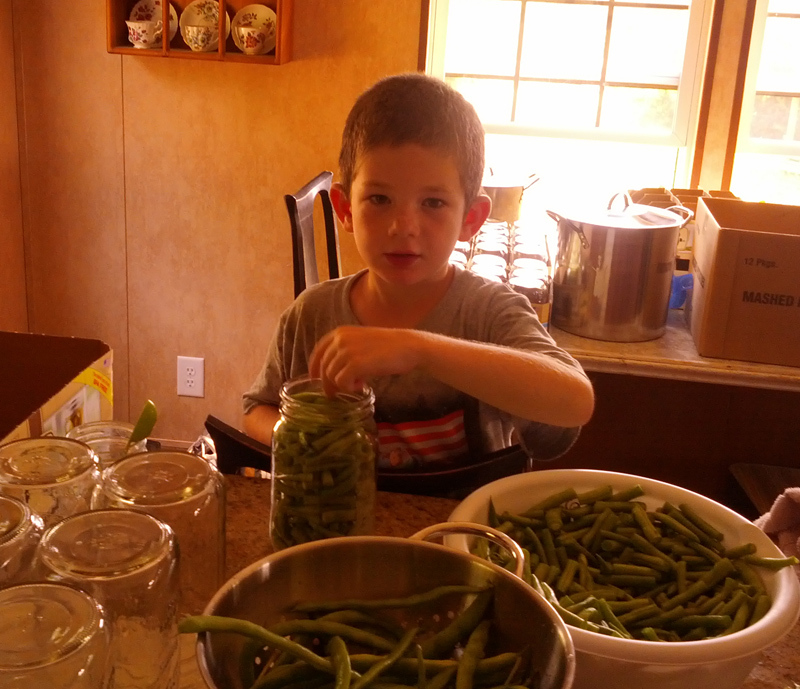 We made 11 quarts of green beans directly from our garden. 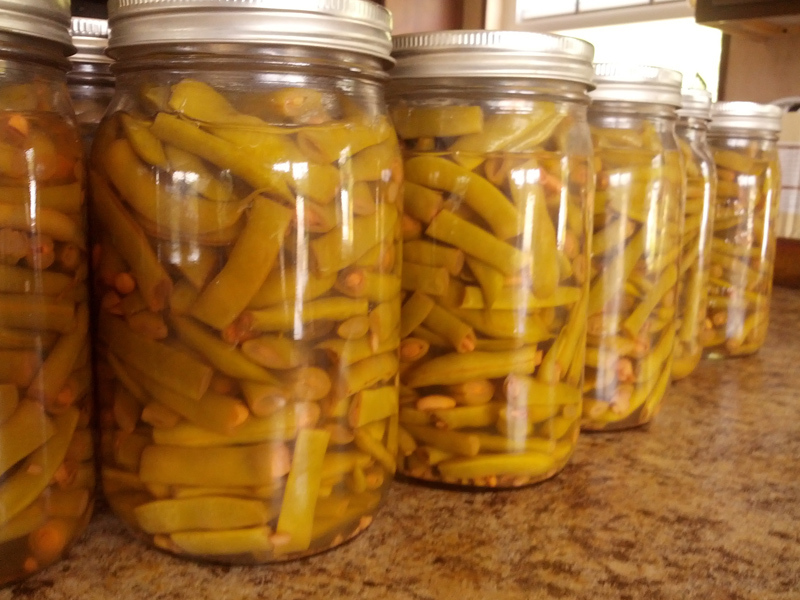 Green beans are an easy way to get started because our processing time was only 25 minutes for quart jars (20 minutes for pints). This was a good place to start in learning how to control the heat of our fire. We eventually want to butcher and can many of our chickens, which will require a 90 minute processing time for quarts and 75 minutes for pints. By then we will have our system down to a science. 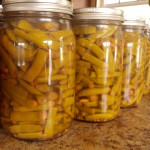 Here are our tips for wood fire canning that we will continue to follow throughout our summer of canning! 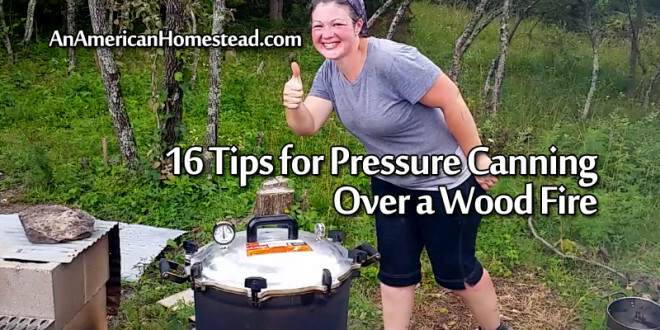 Read your pressure canner’s instructions carefully before you get started. You want to make sure you have a good understanding of what to do before you get going. I used a highlighter to mark important things in mine! Check the weather before you get started. Don’t try on a rainy day. You could get going and have to stop because water on top of the canner reduces the pressure inside. 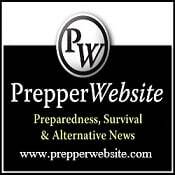 Do as much prep work inside as possible. 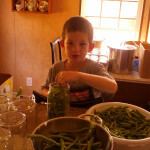 We washed all the green beans, cut them to size and packed them in jars (using the raw pack method). This was the most time consuming part of the process and we were able to do this inside and out of the sun. Have lots of wood, but wood that is too big. Two to three inches in diameter is best. You want your fire to be able to consume it quickly. This is particularly important for longer processing times because you will need to keep feeding your fire. You don’t want your temperature to drop while your wood is trying to start burning. Get a good bed of coals going before you start. It’s good to have about six inches deep of hot coals. So get your fire going about 30 to 45 minutes before you’re ready to start. The distance between our coals and the top of our grate was about 1 foot . If you are doing a short process time (20 to 25 mins) a bed of coals will probably be enough, but for longer burns more wood is necessary. Set you canner pot on the grate and fill it with 2 to 3 inches of water. I went for 3 inches because I didn’t want to risk boiling dry! We let our water heat while we prepared our jars to put in the canner. Unlike water bath canning, no sterilizing of the jars in necessary. Just make sure they are clean. Put the lids on the jars and put them in the canner. Put the pressure canner’s lid on and let it come to a boil. Make sure that you follow the manufacturer’s instructions carefully when sealing the canner. Most of the accidents happen because a lid has not been properly attached. After you put your jars in and the lid on, let the steam vent in your canner according to the instructions. Ours says 7 minutes. Air trapped in the canner means that the temperature will be lower than optimal and your food may not be processed correctly. 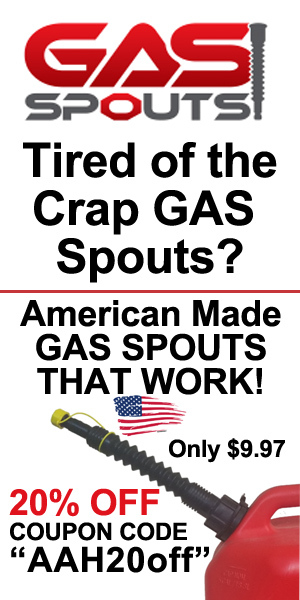 So, you want to make sure you vent the steam properly. After this, put your weight on and start to watch the pressure rise. Ours took about 10 minutes. Start timing your processing time when the pressure gauge registers the correct pressure and the weight gauge jiggles or rocks according to the instructions. Refer to the manual for your specific canner. Regulate the heat from the fire. Don’t leave your canner unattended. You will need to watch your fire and your pressure canner’s gauge carefully in order to regulate the heat. 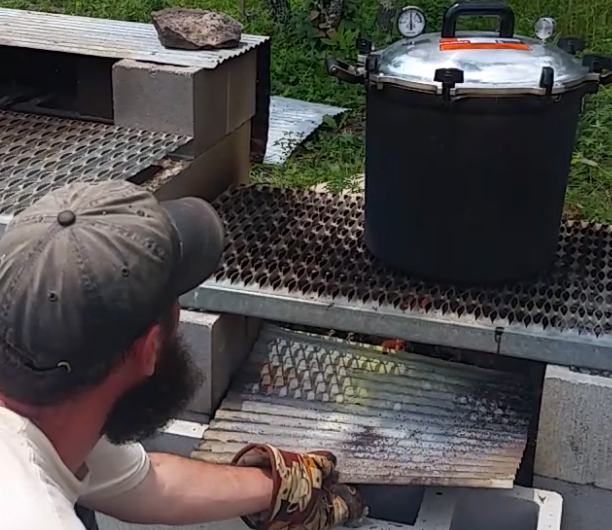 If your canner is beginning to build too much pressure, place a piece of sheet metal over the fire. By moving this back and forth, you can regulate how much heat gets to the grate. You will probably also need water to cool the sheet metal. If pressure is continuing to build, pour water directly on the sheet metal and not the fire. You want to keep your coals hot in case you need to add more wood! 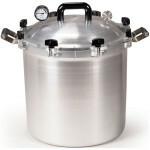 If your canner is showing signs that the pressure may be about to drop, you will need more heat. Remove the sheet metal and feed the fire. Remember that the fire will need to be hottest when you first put your food in the canner in order to bring it to the right temperature and allow steam to escape. Once you achieve the right pressure, you will want to keep it there for the entire processing time. If the pressure drops, you will need to start your time again (from the beginning) once you get back to the right pressure. If you consistently hold a higher pressure than the instructions, you run the risk of boiling your canner dry. You will ruin your canner! The sound of the weight rocking means that your canner is holding the correct temperature inside. The instructions for our canner say that it should ideally jiggle between 1 and 4 times per minute. Any less and the pressure is beginning to drop. Any more and the temperature is too high. This is when we poured more water on our sheet metal to cool the fire. Again, regulating the heat is very important (#8). Make sure you check the pressure you need for your altitude and follow your canner’s instructions. Ours is 2250 feet, so we generally need 15 pounds of pressure. Higher altitudes will lower the temperature inside the canner so a higher pressure is required. A higher pressure means a higher temperature inside. It helps to get the biggest canner you can afford. This way multiple batches are not necessary. To get the pressure in our canner to come down, we had to completely douse the fire with water. If you have a smaller canner, slide it off the heat source. This way you will able to keep your fire going and do multiple batches. For safety’s sake, don’t move it far and run the risk of dropping it. It’s best just to slide it to a non-heated location. Make sure your canner registers zero pressure before you open the lid. Don’t be in a hurry. Don’t try to cool it by pouring water on it. You run the risk of ruining your food because forced cooling can cause loss of liquid from jars and seal failures. After the canner is depressurized, remove the weight from the vent port and wait 10 minutes before opening the lid. Always open it away from your face so that steam doesn’t burn you. Pull out your jars carefully with a jar puller. If it is cold outside, let your jars cool in the water with the lid off. Too severe a change in temperature when you pull out your jars can cause them to burst. This can cause burn injuries. Just one more note. We found two grates at our salvage yard for a total of $10. We supported them with rebar and placed them on the top of two levels of concrete block. 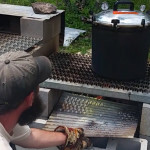 It works well and makes outdoor wood fire canning possible for almost no initial investment, except for the canning supplies themselves. It is totally possible to get started! As we go, we may work on this setup. It would be nice to find a good thick piece of steel, one that could support the weight of our heavy canner and keep our pots from getting scorched. We wouldn’t trust sheet metal to do this. It would also be nice to have a more enclosed fire that would keep smoke out of our eyes. I think an old wood cookstove would be perfect for this. Perhaps that is in our future, but for now what we have is very functional. It was put together in less than an afternoon and we were canning the next day. Please view this episode for the video of our first outdoor canning experience! 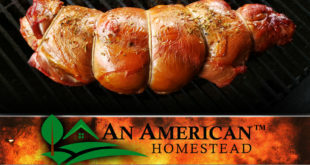 How did you guys rotisserie the lamb on the other grill? We put the lamb on a t-post and lay the ends of the t-post on the concrete block on each side. We turn it periodically as it cooks. I would only use the All American brand for pressure canning over a wood fire. Very high quality products.